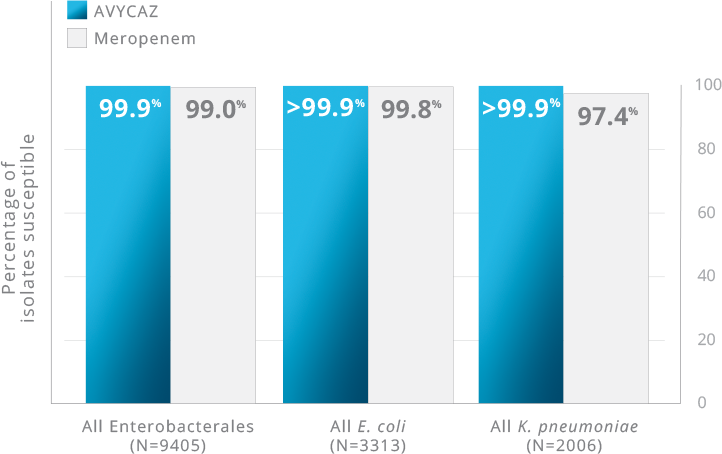 In vitro activity does not necessarily correlate with clinical efficacy results. View clinical results, including results by pathogen for the HABP/VABP Trial , results for cUTI Trial 1, results for cUTI Trial 2, and results for the cIAI Trial. FDA, Food and Drug Administration. CLSI, Clinical and Laboratory Standards Institute. * E. coli (N=607), K. pneumoniae (N=364), P. mirabilis (N=46), K. oxytoca (N=44). 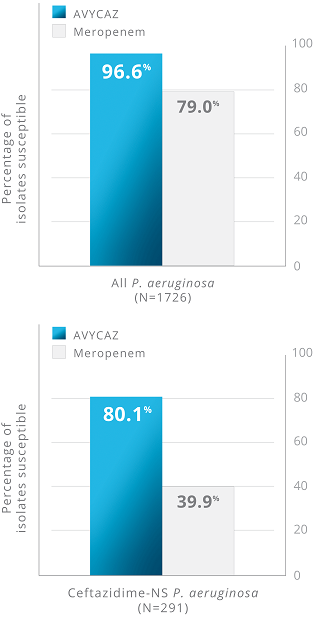 †Meropenem is not shown because all KPC-producing K. pneumoniae isolates tested were nonsusceptible to meropenem. References: 1. Data on file. Allergan, Inc. 2. Patel JB, Cockerill FR III, Eliopoulos GM, et al. Clinical and Laboratory Standards Institute. Performance standards for antimicrobial susceptibility testing; 26th ed CLSI supplement M100S. Wayne, PA: Clinical and Laboratory Standards Institute; 2016.